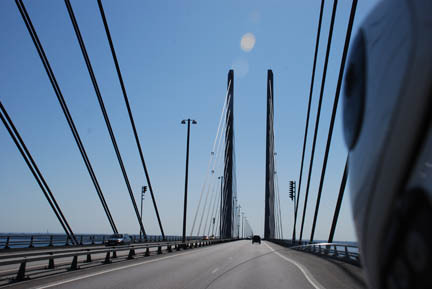 We took the new tunnel/bridge to get to Sweden from Denmark. Yes, tunnel/bridge is correct. First you go into a tunnel under part of the sound and pop up on a (I think) man-made island. Then you go onto a long, high bridge. When you land there is a toll booth and (the equivalent of) forty dollars later you are in Sweden. Sweden is part of the EU and again there was no customs check. Just like changing states in the USA. Our first night was spent in southeastern Sweden at an area famous for its fine glass blowing shops including Boda and Orrefors in the towns of the same names. We spent the night in a small city-run campground. It only cost 100 Kroner, a lot less than the 220 Kroner we have been paying. (At 5 or 6 to the dollar that makes most camp sites costing 35 to 45 dollars per night, for a tent site with no hookups, just a spot in a grassy field with a toilet building over there, and showers are an additional 10 Kroner each!) 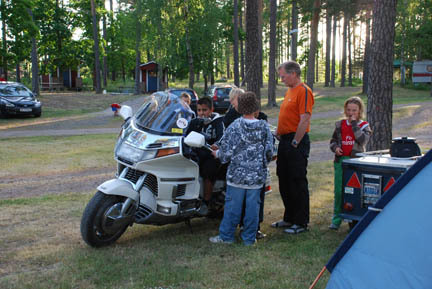 While there some kids from a group of Danes became interested in the bike. Between them they spoke enough English that we were able to converse and they were very happy when I let them take turns sitting on the bike, but I refused to give rides around the campground. Once we got settled in the Stockholm campground (at 210 Kroner/night) we went into town for a walk. 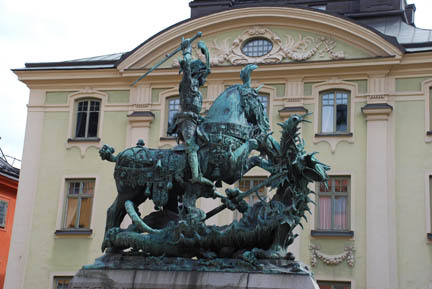 We hit the pedestrian area in the old town and poked around in the souvenir shops and met up with St. George and the Dragon (poor little dragon). 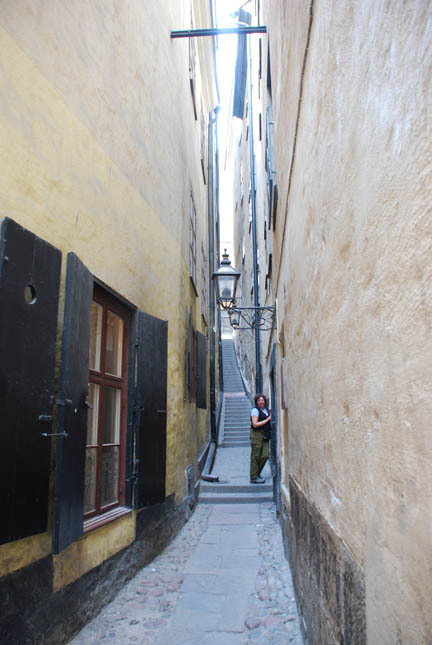 We saw "the narrowest street in the world", just under 3 feet wide (their claim, not mine). But otherwise nothing was there but a couple of doorways in the 100 foot long "street" made up mostly of stairs. The next day we went to see the "Vasa". The Vasa is a warship built in the middle of the 1600's for one of the many wars fought between the nations of the Baltic Sea. She had 48 cannons in ports along her sides and three masts reaching to the sky. On her inaugural cruise she set out into the harbor with all the celebrities watching, or riding. She had her gun ports open and showing her cannon. A gust of wind came along and laid her over far enough that the lower gun ports were submerged, she took on water and sank in the harbor. 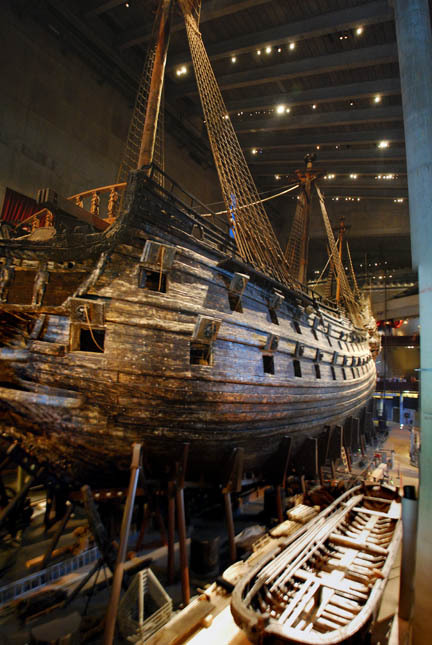 The was the end of the Vasa until she was raised in the 1900's. The mud and water preserved her almost like new. About 20 people died, mostly crew that was below decks. She is complete with all decoration, hundreds of carvings, but not the bright paint. 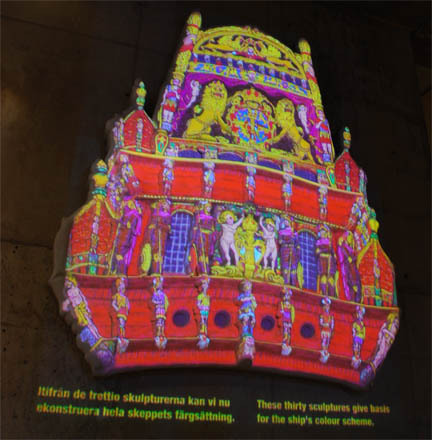 This is a computer re-creation of the stern projected onto a three dimensional mold of the stern that is mounted on the wall. Each of the gun ports had a lion's face on the underside so that when they were lifted and the ports were open there were dozens of roaring lions looking at the enemy. 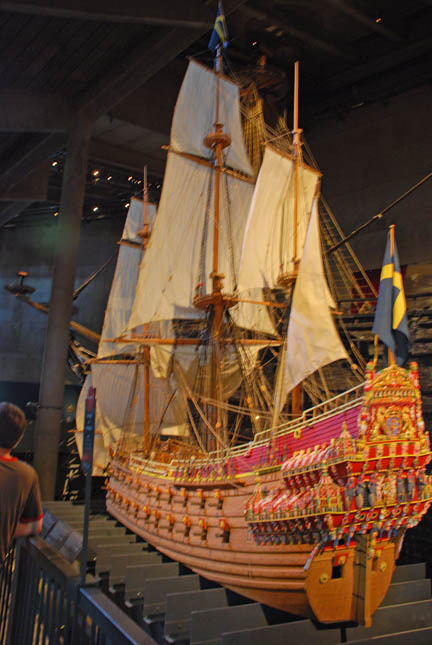 This is a model of the Vasa. It is about 8 feet long and high. You can see the brightly colored stern and the open gun ports with their yellow lion on the red underside of the port's lid. It must have been a majestic ship! Too bad it never made it out of the harbor. The current thinking is that she was designed too narrow, had gun ports too low and not enough ballast on board. When the wind gust came she heeled over and submerged the lower gun ports. As the water poured in she heeled more and went down. She settled into the mud in a vertical position. She was raised by digging tunnels under the hull and running cables under her that were attached to floating barges. They would partially fill the barges with water and take up the slack in the cables, then pump the water out, lifting the Vasa. 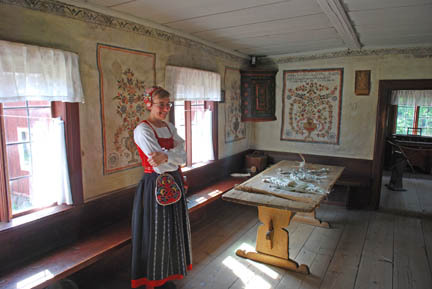 Then we went to the Swedish folk village called "Skansen". It had a small zoo of Nordic animals and lots of 17 and 18th century buildings. Again people were in costume and doing crafts of the period. 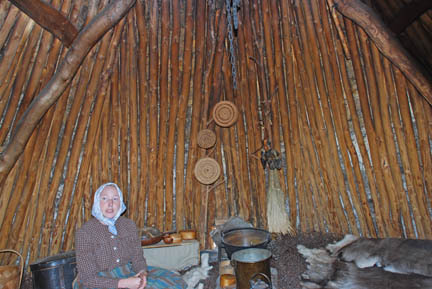 There was one area of "Sami" culture. These are the people that would be closest to the Inuit people in North America. They live in the far north and herd Reindeer to support themselves. They used to live in these stick and turf huts and follow the migration of their herds. Today they have moved into manufactured homes and drive snowmobiles. Part of the fun of visiting the museum and folk park was that we had to take a ferry to get to them, and it was included in the bus ticket. 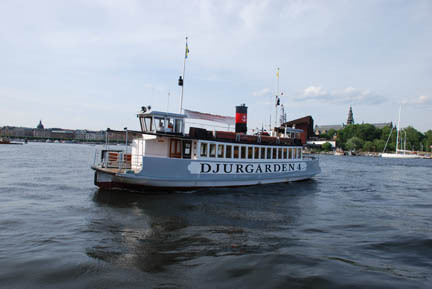 The Vasa museum is just visible over the right end of the ferry, it is the dark wedge-shaped building. 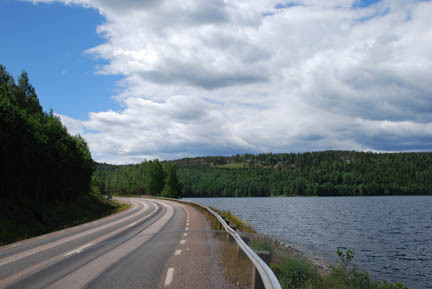 From here we headed west across the width of Sweden to Oslo in Norway. After 3 weeks of running through the "Low Countries" (Belgium, Holland, NW Germany, Denmark and S Sweden) we are finally getting some contour into the land. Up until now we have stayed within 50 feet of sea level, one side or the other. We got up over 700 feet in elevation on this run! Also the land has changed from sand and mud based dirt to solid bedrock with a thin layer of dirt on top. In addition the vegetation has changed from farming to forestry based. Very interesting to me as a retired forester. The techniques of harvest are the same as we use in Washington State, i.e. thinnings of varying density as well as clear cuts with patches of leave trees and snags left, or created, for raptor birds to use. The reforestation, which was my primary duty, is done promptly, like at home, and then the stand is intensively managed until the next harvest. I felt right at home.